Pete Johnston, Head Coach of Ireland Wolves, said his participating in the games had been slowing his recovery. “James flagged some soreness in his right shoulder at the beginning of the tour, but with careful monitoring and rehabilitation work by our medical staff here in Sri Lanka, we hoped he could complete the tour and return to throwing 100% pain-free,” he said. “After this last game, it has now become clear that James’ shoulder is still hampering him and playing in these games is slowing down his recovery from the injury. Johnston said that while a number of players were considered as a replacement for Shannon, it made sense to bring in Singh, who would benefit from a short travel distance from India and only a slight variation in time difference ahead of the third 50-over match tomorrow. 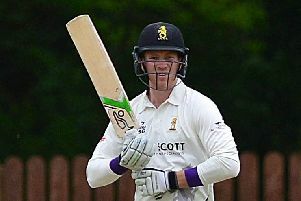 “With three white-ball games remaining on the tour, the selectors considered a number of options to replace Shannon, but decided it would be a great opportunity to bring Simi Singh over from India as there would be limited time difference and short travel distance,” he said. “Simi was part of the batting camp in Bangalore in December, and has spent much of the last two months working on his bowling by adding leg spin to his armoury in addition to his off spin.